Recently, I was invited to Ciccio's/Water to sample some menu items and being that the Ciccio Restaurant Group restaurants have all been incredibly fantastic so far, I was looking forward to it all week! Ciccio's, located in South Tampa on Howard, is California Cuisine and a section of Ciccio's is Water, offering unique (and I add, fantastic) sushi. From the outside, one would think that Ciccio's would be dark and quiet. However, I was pleasantly surprised by the bustle inside. Combine already flowing conversations and good music along with the unique lighting (there is a lot of blues and browns, which go together rather well), and it really is a top place for dinner and drinks. When we arrived, we were taken to a table and given food and drink menus. Even though we would be sampling different items on the menu, brought over by the manager (Steve) and our server, I always like to look at the menu to get an idea of what is served there. Ciccio's/Water offers Fresh & Crisp Appetizers (or small plates), Salads, Pizza, Stirfrys, Water Bowls, Sushi Rolls, California Grilled Wraps, Pasta, California Bowls and other entrees. What I noticed immediately and love about Ciccio's is that there is a conscience effort to remain healthy and they offer meal options for those with healthy eating in mind. Fresh veggies are served with each Ciccio Entree and you can request brown sticky rice in any dish that comes with rice or noodles. If you want pizza, you can choose from Brick Oven Thin or Gluten Free Thin. You can also get your wraps made with a whole wheat tortilla. After looking through the menu, we decided on 2 drinks. We were immediately drawn to the Specialty Sake Cocktails since I've never tried Sake before and decided on the Water Blue cocktail and the Strawberry Sake Mojito. 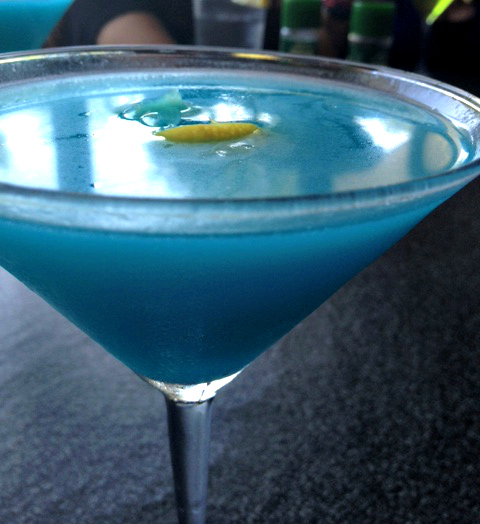 The Water Blue is made with Sake, Stoli Razberi, Blue Curacao and Sour Mix. The Water Blue is so incredibly flavorful and I would say it tastes very much like a Blue Raspberry Airhead (something very much to my liking) with a strong, but delightful finish. 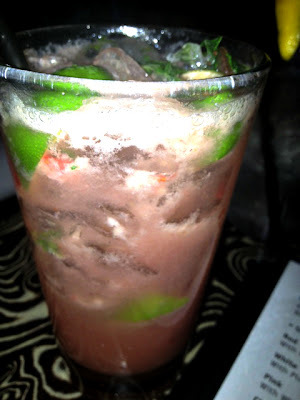 The Strawberry Sake Mojito was a highlight drink for me. This Mojito is made with muddled strawberries, mint, sugar and club soda and it was simply amazing. Next, the food arrived! 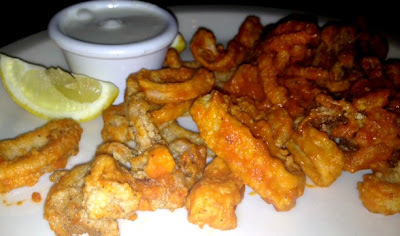 First, we tried the Buffalo Calamari with blue cheese aioli. I have to say that this was some of the best calamari I've had and certainly the best buffalo calamari I've had. Perfectly cooked and with just the right amount of buffalo sauce, I would highly recommend this dish as a starter. Next up were Chicken Meatballs. 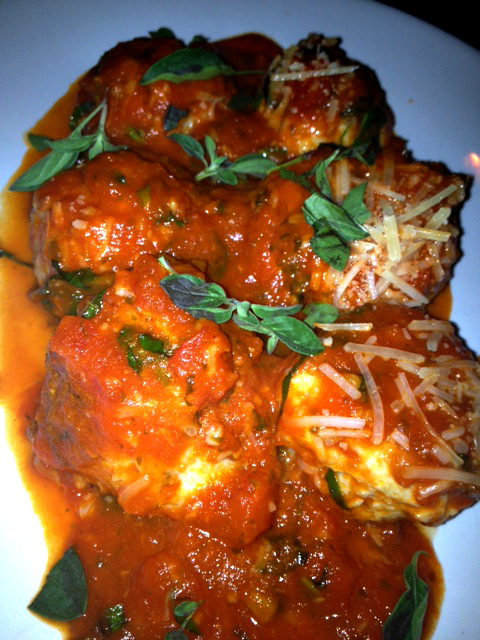 The Chicken Meatballs were served in a roasted tomato sauce with fresh oregano and parmesan cheese and I'm lucky I was able to snap a picture because they were gone quickly. Also as a start to the meal, we had the special, Baked Portobello Fries (unpictured- they were so good, they were gone in an instant). The Portobello Fries are baked with cheese and Panko breadcrumbs and served with a goat cheese fondue that is creamy and pairs perfectly. Next up were the Beef Short Rib Soft Tacos and Filet Mignon Quesadillas. 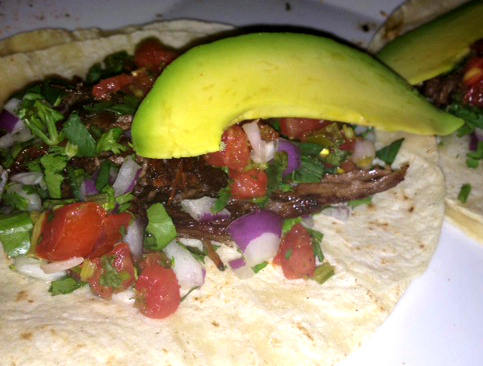 The Beef Short Rib Soft Tacos are made with red onion, cilantro, avocado and poblano pico de gallo. The meat was so juicy and flavorful, especially with the taste of the cilantro. I loved that each component could be picked out, yet combined so well together to make a cohesive dish. The avocado was a nice addition and the poblano pico de gallo added a small spice. 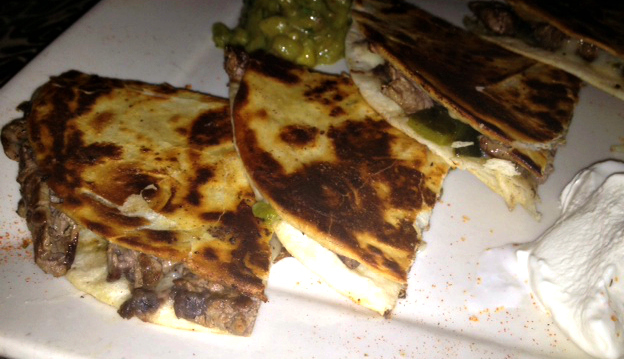 The Filet Mignon Quesadillas were a favorite item of the night. The Quesadillas are made of strips of filet mignon, black beans, roasted poblanos and cilantro and served with spicy corn guacamole and sour cream. Again, the meat was juicy and flavorful and cooked very well. Of course, the spicy corn guacamole was unique and incredibly flavorful. 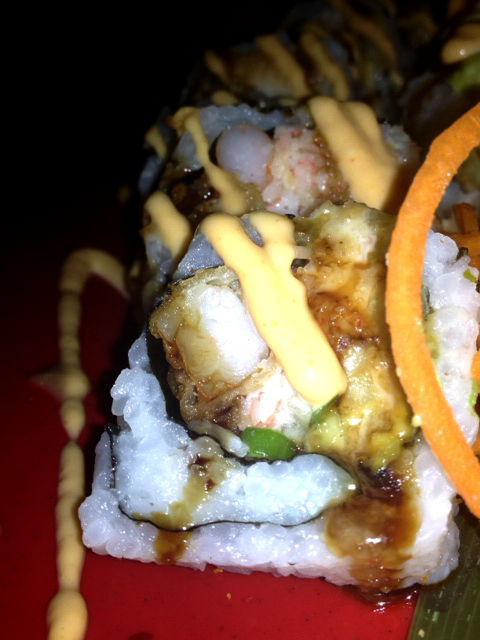 Next, we tried 3 different sushi rolls: Dino & Jimmy, Volcano and one of the specials being offered that evening. The Volcano roll (pictured middle above) is composed of fresh Alaskan crab, cucumber, scallion, cream cheese and crispy onions, topped with wonton flakes and avocado, served with a warm seafood dip, kabayaki glaze and sriracha aioli. The Dino & Jimmy roll, named after those who created it, is made with Alaskan crab meat, tempura shrimp, cucumber, avocado and scallion, topped with kabayaki glaze, sriracha aioli and sesame aioli. 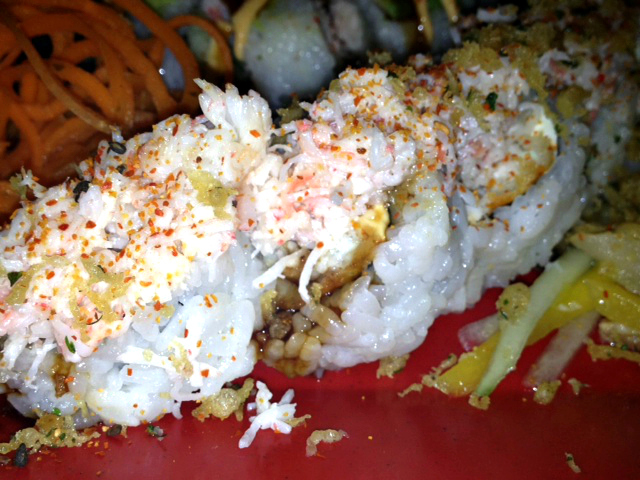 The special roll we tried was made with tempura grouper, cream cheese and mango and topped with a lemon crab mix. All rolls were made with white sticky rice and I thoroughly enjoyed each one! The ingredients in each roll are obviously fresh and the combined flavors were sensational. When I was talking to people about Ciccio's/Water, every single one said to try the sushi and I would recommend others to do the same - it's what they know and it shows! 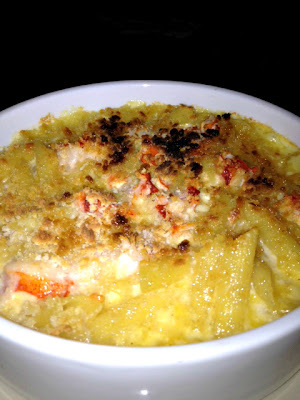 Now, for my absolute favorite part of the meal: Lobster Baked Mac-N-Cheese with Truffle Oil Drizzle, something that we just had to request after seeing it on the menu! Topped and baked with cheese and breadcrumbs, this dish was so rich and creamy! 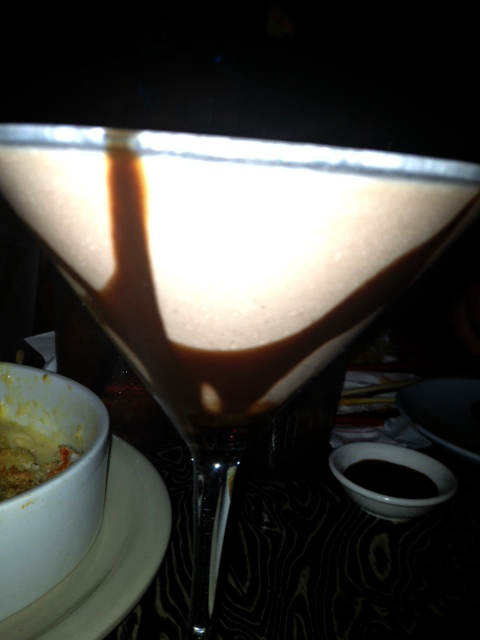 Lastly, for dessert, we selected the Apple Blossom and Tiramisu and I had one last drink, the Chocolate Chip Heaven. The Apple Blossom is a classic treat, with warm apple cinnamon and a delicious crust, paired with vanilla ice cream, strawberries and pineapple chunks. Tiramisu is one of my favorite desserts, but sometimes the coffee flavor is a little overwhelming. 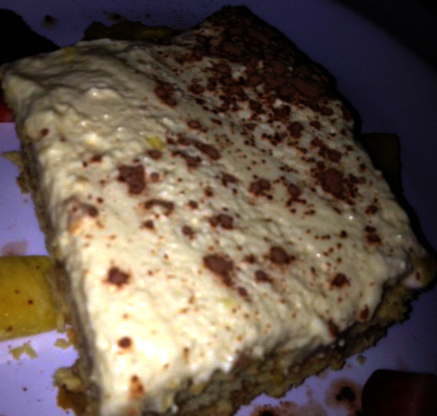 I had zero complaints when it came to Ciccio's Tiramisu. All of the layers blended really well together and it was the best tiramisu I've ever had. We were brought an ice bucket with shots and a lit sparkler! I geeked out and got a little crazy excited over the sparkler, but it completely made my night! 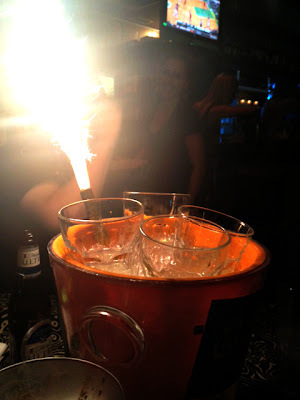 You can order a sparkler bucket as well; in fact, there were a lot of tables partaking in the fun with their group! With 3 locations in the Bay area (SoHo, New Tampa, St. Petersburg), we sure to stop in for a meal! Ciccio's features a happy hour every week day and has a live DJ every Friday and Saturday evening. Also, Ciccio's is now open for lunch on Saturdays with live music on the patio from 1-4pm! Specials change weekly so there is always something new to try. 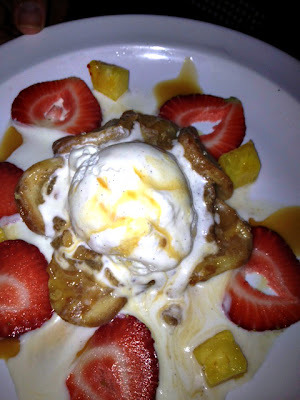 Finally, a huge thank you to Ciccio's for having me in and Steve for taking care of us! Be sure to 'like' Ciccio's on Facebook and follow them on Twitter! OMG that water blue looks and sounds delish! How have I lived in Tampa all my life and never heard of such an amazing restaurant?! Hopefully this will be a date night for Danny and I in the near future!